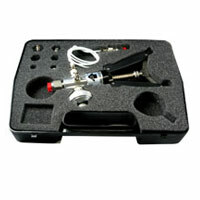 TP1-40 Pneumatic Pressure Calibration Pump. 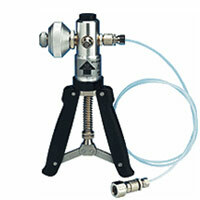 TP1-40 Pressure Vacuum Pneumatic Hand Pump generates pressure up to 600 psi or -28"Hg. unlike the competition's disposable models. fine-tuning adjustments or stroke adjustments. transmitters, transducers, relief valves, or similar instrumentation. Generating up to 600 psi pressure or -28 inHg vacuum. digital indicators and analogue gauges. Materials: Bright nickel plated brass, clear anodized aluminum. Dimensions: 220mm (L) x 105mm (W) x 63mm (D). Weight: 510 grams.